Wendy Brown charts the ‘stealth revolution’ that’s transforming every aspect of society -- and now has democracy in its sights. ‘Neoliberalism’ is a much confused and maligned term these days. Progressive activists deploy it derisively as a general sort of derogatory label; learned professors write articles on the topic without really saying anything more penetrating. It’s as over-used an idiom as globalization (or as capitalism and socialism were 70 years ago). Even Anti-Flag take up the subject in their 2012 track “The Neoliberal Anthem”: “Strap in and watch the world decay!” they proclaim. Blunt, but not inaccurate. Yet for all its confounded usages, what exactly does it signify? But it’s much more than that. 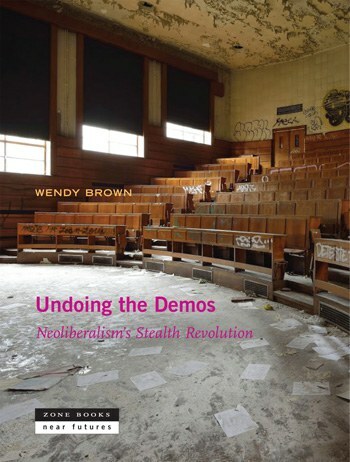 Now, in Undoing the Demos: Neoliberalism’s Stealth Revolution, political theorist Wendy Brown contributes a truly useful text on an over-wrought topic, and one which focuses not only on the economic manifestations of neoliberalism, but on its broader effects on our political and social thinking. “Neoliberalism is a distinctive mode of reason, of the production of subjects, a 'conduct of conduct,' and a 'scheme of valuation,'” she writes. It’s a mode of thinking, and the manner in which it emerges can be infinitely varied. We must be alert to neoliberalism’s “inconstancy and plasticity”, she warns, and its ability to reconfigure itself in new guises. Neoliberalism “takes diverse shapes and spawns diverse content and normative details, even different idioms. It is globally ubiquitous, yet disunified and nonidentical with itself in space and over time.” It’s a slippery beast, in other words – hard to define and even harder to see when it’s happening. Brown’s work is an important and vital contribution at this time insofar as it takes aim at the beating heart of neoliberalism: its insinuation in the very institutions and identities which were hitherto used to limit its spread; institutions which, it was once hoped, would sustain deeper and more profound values implicit to democratic society and human sociality. Brown is less interested than other scholars in the grim economics of neoliberalism: what she focuses on is its implicit threat to democracy. She opens her book by charting the emergence and contestation between ‘homo politicus’ and ‘homo oeconomicus’; between the human who uses politics to shape their world, and the human who is driven by self-interest and sees the world as always already shaped by economics. French philosopher Michel Foucault discussed this dichotomy in his 1978-79 College de France lectures on the Birth of Biopolitics, and Brown analyzes what Foucault saw – and failed to see – about this early emergence of neoliberal rationality. In a superb if lamentably short section on gender ,she also discusses the question: “Does homo oeconomicus have a gender? Does human capital? Is there a femina domestica invisibly striating or supplementing these figures…?” Her point is that “liberalism’s old gender problem is intensified by neoliberalism”, or that neoliberalism impacts women with particular vehemence. Having discussed Foucault’s early charting of neoliberal political rationality, and expanded on his ideas in light of neoliberalism’s trajectory in the past 30 years, Brown analyzes some modern examples of neoliberalism’s diverse expressions. She looks at how it has insinuated itself in governance – in the notion of building consensus, rather than appreciating contestation; in the depoliticization of government; in the valorization of benchmarking and best practices. All of these deliver destructive blows against democratic political will, against the notion that humans can determine their own destiny and ought to shape their own reality. Instead of making their own decisions, governments appoint ‘external consultants’ to tell them what they should be doing; instead of inventing new ideas and ways of doing things, governments survey ‘best practices’ and see what everyone else is doing. It represents, in many ways, the triumph of mediocrity. Neoliberal rationality infects law and legal reason, as well. Brown offers an in-depth analysis of the Citizens United case, which protected the right of corporations and the wealthy to dominate democratic elections in the US with their overwhelming power of capital. She also offers one of the best and most thorough analyses of how neoliberal rationality is destroying higher education: the post-WWII dream of an educated and equal society has been twisted into an economistic view, which holds that universities exist only to enhance capital; and that the purpose of an education is not to become better able to contribute to the broader political community, but rather to enhance one’s own ability to generate further capital. Brown’s book is theoretical yet accessible; it’s an important and vital interjection which reveals and casts bare the neoliberal rationality that increasingly governs our world. There’s an implicit warning in Brown’s text, which she addresses briefly but is worth some additional reflection. Audre Lorde famously cautioned against using the master’s tools to dismantle the master’s house, and increasingly this is precisely the direction in which efforts to limit the ravages of neoliberal thinking have turned, using economistic arguments in an effort to preserve institutions and principles that are premised on other-than-economistic values. Some examples serve to illustrate this. In the ‘80s and ‘90s, public-private partnerships (P3’s) emerged as a neoliberal strategy transferring control and responsibility for public infrastructure – roads, bridges, hospitals, schools – into private hands. The basic argument held that the private sector, not beholden to political interests but rather to principles of efficiency and maximization of cost and utility, would prove more efficient custodians of public infrastructure. This neoliberal argument piggybacked nicely onto the drive to lower taxes. In an environment where lower taxes resulted in reduced state budgets, maximizing cost and efficiency would ensure public dollars stretched as far as possible. This argument was received sympathetically by a public which had been worked up (by conservative pundits and politicians) into a collective sense of outrage over personal tax obligations and a sense of diminishing consumer power. It struck an affective chord, even though it was not based on any solid research. Yet P3’s became a dominant and accepted approach to building and maintaining public infrastructure and services. All this is true, and revealing the truly ineffective and inefficient nature of P3s has been critical to turning them back in many cases. However, there’s a problem with this. These campaigns against P3s adopt the same economistic principles as were used to promote the notion of P3s in the first place: namely, that efficiency, cost maximization and capital enhancement ought to be the driving principles of the demos, or public state. The implicit argument is that P3s are wrong not because they transfer public ownership into private hands, but because they do so inefficiently and at the expense of the taxpayer. Granted, there is often a reference to P3s being ‘unaccountable’ to the public, but this is rarely interrogated or explored as deeply as it should be. In fact, it ought to lie at the core of public resistance to P3s. Public-private partnerships are wrong simply because the state ought never to allow public goods to fall under private control, even if it might save more money. Economization ought never to hold sway over the values, principles and political power of the public. Similarly, neoliberal logic has infected other efforts to fight back against neoliberal initiatives. Labour unions – a common target of neoliberalism -- are increasingly defended on the basis that they benefit the economy (through ensuring consistent and safe workplace practices as well as strong wages to bolster consumer spending in the community), rather than on the simpler basis that workers deserve the right to control their working conditions. Efforts to reduce tuition fees for out-of-province/state or international students are often predicated on the notion that their economic contribution to the local economy exceeds the value of their fiscal contribution to the university through tuition fees. Nowhere – or rarely – is the argument presented that post-secondary ought to be a public good and universal right in and of itself. The danger, in other words, is that efforts to resist neoliberalism are increasingly being expressed in such a way that they serve to entrench and legitimize neoliberal values – economization, efficiency, capital enhancement -- rather than questioning or challenging the desirability and social and political consequences of those values in the first place. Brown comes close to a forbidden truth in closing. She notes, with great delicacy and hesitation, the similarities between neoliberal rationality and fascism. “This is not to say that neoliberalism is fascism or that we live in fascist times,” comes the inevitable caveat. But what if it is an emerging form of fascism? One of the troubling trends that’s emerged in recent decades and needs to be challenged more forcefully is the notion that it’s intellectually taboo, inaccurate or excessive to call something ‘fascist’, or to draw analogies to fascist states like Nazi Germany. An example of this taboo is ‘Godwin’s Law’ – the notion that referring to Hitler (or by extension, fascism broadly) destroys the credibility of your argument. It’s a trendy term, but intellectually dangerous. The fact is, fascism was – and is – very real, and the notion that no one should talk about fascism as seriously emerging in the present day is very much a product of our neoliberal era. In fact we do need to talk about it. The skepticism with which the term ‘fascism’ is treated; the dismissal of arguments which make reference to Nazis, all collaborate in erasing and masking the very real resemblances that exist between historical fascism and contemporary forms of governance like neoliberalism. In its demand for self-sacrifice to the heartless whole – a demand iterated, for instance, in the sacrifice of millions of homeowners and mortgage defaulters in order to save the banks during the subprime mortgage crisis – neoliberal rationality resembles the demand for citizen self-sacrifice that characterized fascism. George Orwell (in his remarkable book review of Adolf Hitler’s Mein Kampf) warned against underrating the emotional appeal of fascism. While socialism and even capitalism offered a vision of the good life – fewer working-hours, health and education, leisure and pleasure – people appear inevitably lured by the attraction of struggle and self-sacrifice. “Whereas Socialism, and even capitalism in a more grudging way, have said to people ‘I offer you a good time,’ Hitler has said to them ‘I offer you struggle, danger and death,’ and as a result a whole nation flings itself at his feet,” he wrote. The same could easily be said of neoliberalism: people have a remarkable knack of voting for economic tough-guys who promise to make life harder on individuals and communities in order to ‘save the economy’, whatever that's supposed to mean. Brown’s book is essential reading not only for academics but for anyone concerned with our collective political future, and with the defense of democratic politics. Her book ends on a grim note: “Despair” is the title of its final section. Brown has eloquently elucidated the problem, and made a profound contribution to understanding the complex nature of neoliberal rationality and its threat to democracy.